And whatever you do, do it heartily, as to the Lord, and not to men, knowing that from the Lord you will receive the reward of your inheritance; for you serve the Lord Christ. Parent-Teacher Fellowship (PTF) is an organization made up of parent volunteers who give their time and talents to serve teachers, administration, parents, and students through various projects and events though the year. The vision of the CCA PTF is toserve and encourage teachers and families as we work together to build up the body of Christ. or an admin staff member by knowing some of their favorite things. Click the image to view the staff’s Favorite Things list. We would love to have you join our volunteer team! Simply fill out the application linked below. We kicked off the second quarter with a sweet time of fun and fellowship on the evening of October 11th from 4-6 pm. 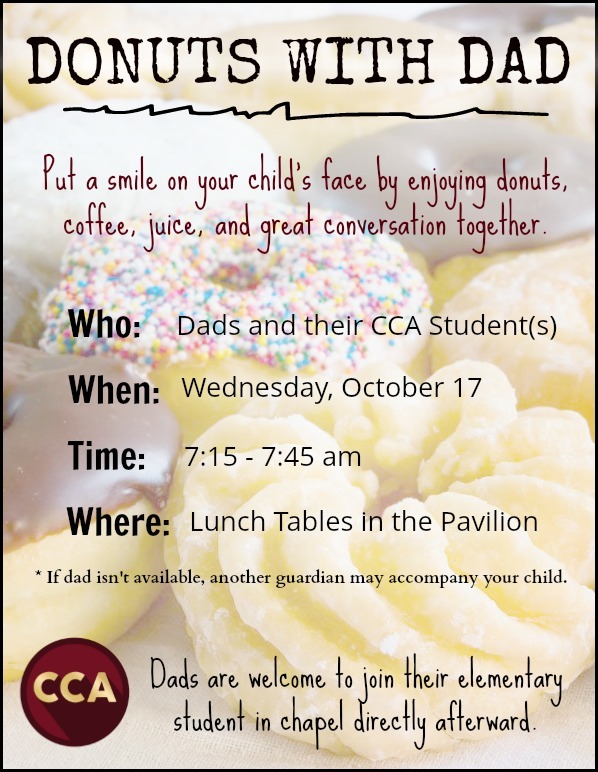 Donuts With Dad was a great time of fun and fellowship as fathers got a time to enjoy their kids. The Favorite Things list is a way that families can bless your child’s teacher or an admin staff member by knowing some of their favorite things. Click the image to view this school year’s Favorite Things list. The CCA Spring Box Top Drive is here. We will be collecting box tops from February 18 - 22, 2019. 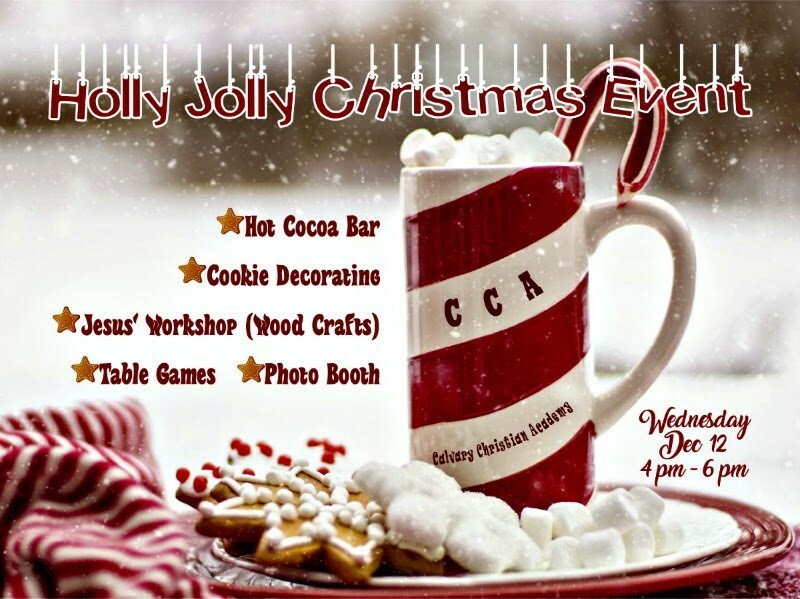 The Holly Jolly Christmas Event will be a fun time for the whole family right before the Christmas/Winter Break. Join us on December 12 from 4-6 PM at Fusco Pavilion by the lunch tables. Wednesday, April 17, 2019 from 7:15 AM - 7:45 AM. We are looking forward to a great time with our Moms!! We have set aside this week, May 6 - 10 as Teacher Appreciation Week to honor our Teachers and Teacher’s Aides. We would love to have you join us this week as we appreciate them and all their work on behalf of our children. 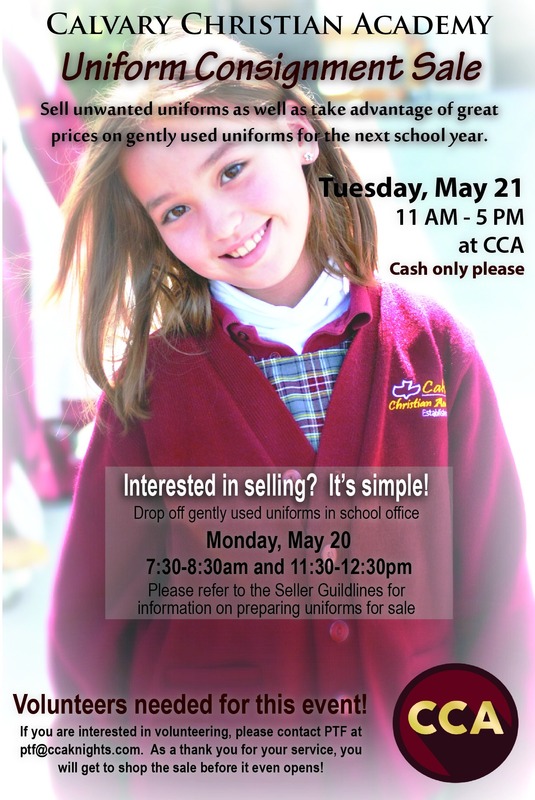 Now is your chance to sell unwanted CCA uniforms, as well as take advantage of great prices on gently used uniforms for next year at our annual PTF Uniform Consignment Sale! Click here to download the seller guidelines.